Device make, model, operating system, advertising identifier, and similar device information. Information about your use of features, functions, or notifications on the device. Device location, if you have consented to the use of location services. Technical data such as WiFi or Bluetooth signal strength, battery level, and similar. If you have consented to the use of background location services, QuakeFeed may collect this information even while you are not using the app. Send you alerts about nearby earthquakes. Calculate your distance from an earthquake event. 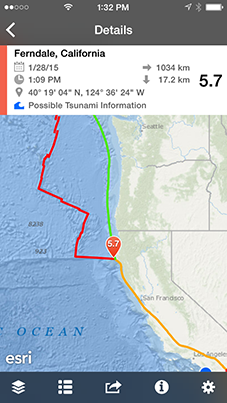 Display your current location on the Quake Map (i.e., the blue dot). Center the Quake Map on your current location when you tap the GPS button. Show tips and information when you enter participating local venues and open the QuakeFeed app. Sending you information related to the use of the QuakeFeed app, which may include notifications or in-app messages. Calculating aggregate, anonymous usage metrics and analytics to improve the QuakeFeed app and prioritize new features. Monitoring and analyzing trends, usage and activities within the QuakeFeed app. Providing you with relevant advertisements. Operating and improving their services. Providing you with advertisements and information on products and services. We may disclose your location data to third parties for the purposes of providing targeted advertisements and information our advertising partners believe may be of relevance and interest to you; these third parties include but are not limited to data aggregators, ad networks and ad serving companies, such as Google, Facebook, Twitter, AOL, Yahoo, Reveal Mobile, VenPath, Beacons In Space and others. You can opt out of the collection of location information by using the iOS Settings app to adjust the Location Services settings. Be advised that turning off Location Services will disable some of the functionality of the QuakeFeed app. Refer to our Privacy FAQ for detailed instructions. We encourage you to learn more about your privacy options related to interest or location-based advertising. Do not use the Email Support feature. If you choose to buy an annual QuakeFeed Premium Subscription via in-app purchase using your iTunes account, you will immediately be charged for the transaction after you tap to buy a QuakeFeed Premium Subscription. Subscription cost will be billed automatically to your iTunes account at the start of the annual period, and will auto-renew until your subscription is canceled. The renewal subscription cost will be the same as the initial cost unless you are otherwise notified in advance. We reserve the right to increase subscription cost at any time upon reasonable notice posted in advance. ALL PURCHASES ARE FINAL AND NO REFUND WILL BE GIVEN FOR UNUSED PORTIONS OF YOUR INITIAL OR ANY SUBSCRIPTION PERIOD. Subscriptions made on iOS devices can be managed and auto-renewal turned off in Account Settings in iTunes after purchase. The cancellation of a subscription will go into effect at the end of your current billing cycle, and you will have the same level of access to the subscription through the remainder of such billing cycle. When your QuakeFeed Premium Subscription ends, the QuakeFeed App will revert to advertising supported free mode.